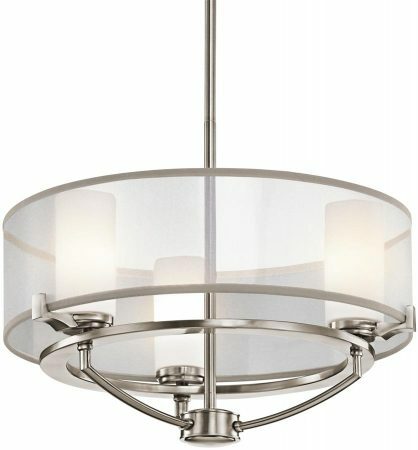 The Kichler Saldana 3 light organza fabric pendant in classic pewter finish is stylish and contemporary. A wonderful, superb quality ceiling light, suspended from a central adjustable height rod, with classic pewter finish frame formed from a broad circular hoop and three curved lamp arms. 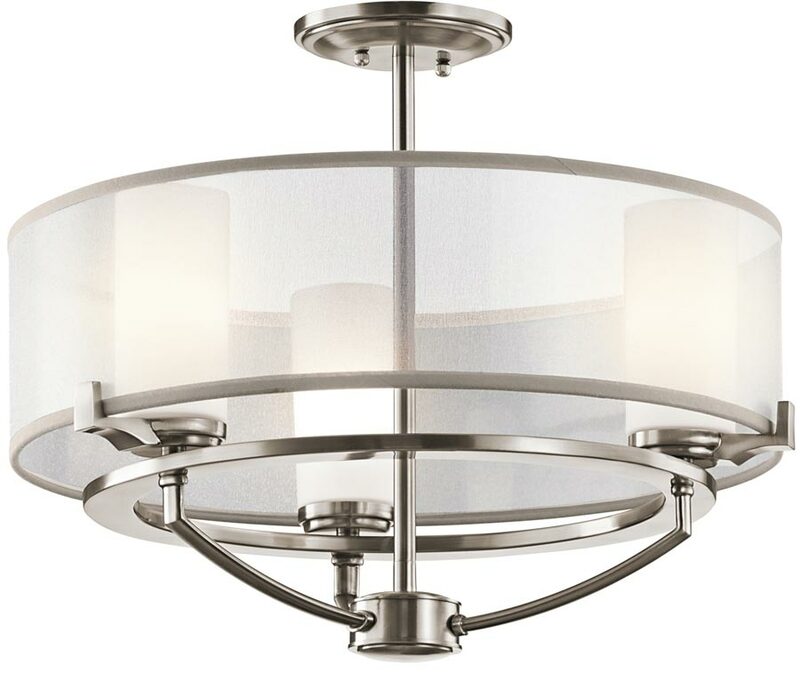 Each arm supports an upright etched opal glass cylinder shade and a translucent organza shade with grey trim is attached around the perimeter. Soft shades give this range a glowing celestial feel. When lit, the outer organza shade shimmers, diffusing the light from the satin etched opal glass shades inside. The structure of the classic pewter finished arms provides the perfect foundation for this light and airy feeling. Supplied with two 15cm and two 30cm rods that can be used individually or in any combination for maximum flexibility at the time of installation. Minimum height 38cm, maximum drop 107cm. Fitting height 36cm. Supplied with non-dimmable 3.5w G9 LED lamp bulbs but will accept higher wattage and dimmable lamps if required. A stunning, sophisticated design offering the ultimate in style and grace. What could look better than this installed over a dining table, in a bright and airy living room or classy bedroom? Other fittings in the Saldana contemporary lighting suite can be viewed below and includes two different sized pendants and a wall light. Designed in the USA by Kichler, founded in Cleveland Ohio in 1938. L.D. Kichler & Co. is a family run business held in high regard for their diversity of design and breadth of range, which includes some truly striking contemporary and substantial light fittings like the Saldana 3 light organza fabric pendant in classic pewter finish you see here.